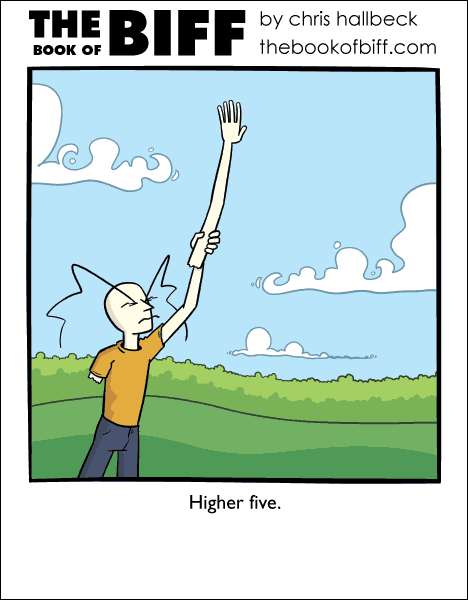 I remember that when I was first taught about high fives it was used in a spontaneous celebration of something that just happened. Like learning to tie my shoes or spell my name correctly. Then I got older and it turned into a trick that older kids used to get you to give them permission to hit you. Instead of a normal high five they get a nice wind up like a major league baseball pitcher and slam their fastball directly into your unsuspecting palm. OK, now THAT is useful! Just don’t pet them with a shovel. I just want to say, I love the style of the clouds in this one. They look awesome.